In the first time I used it, I almost can't recognize whether it's really oil or water, its texture is so light, not like the cooking oil I imagined before.Many reviews said it has a citrus fragrance, I found a little but it doesn't bother me at all. I don't know how to use it properly and found some residues on my tissue. The next time I use it, I thought I know how to use it and SUCCEED! !Well, all you need is dry hands and also dry face, because this cleansing oil will be disappear quickly it it met water.In the beginning I thought oil won't go easily with water. But this one is different. After that put around 1-2 pump of cleansing oil on your hand and apply it on your face and start to massage just like you're washing your face with facial foam. And I feel weird since there's no foam or even something come out to make sure that my make-up is already wiped out.. 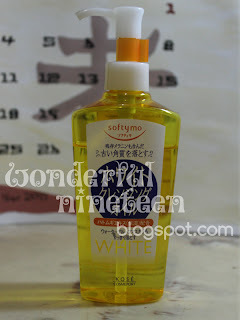 But after 2-3 times using it, I could see the transparent cleansing oil turn into white color, exactly like a milk, just a little. And after that, I put some water on my face and massage around before finally I washed it out with water then finished it with a facial foam. Simple, right? And I like it very much ^o^. Since I cleaned my face with Kose Softymo, I never have any breakouts or acne (that appears because of make-up residues)... so I'm sure this is really a good product for cleansing your face. I give it 4 of 5 for this product.. It's really a good product, although sometimes it gives me some 'not clean yet' feelings after using this. But in fact, it cleans very well. This is my favorite perfume from The Body Shop EVER! Since it has a cute packaging and mild scent of cherry blossom. I love it since the first time I saw it. Beside most of female's perfume from The Body Shop have a nice and mild scent.Well let's get a quick review over it..
As I said before, it has mild scent so I could use it daily. And I think because its mildness, so the fragrance only stands for 4-5 hours. 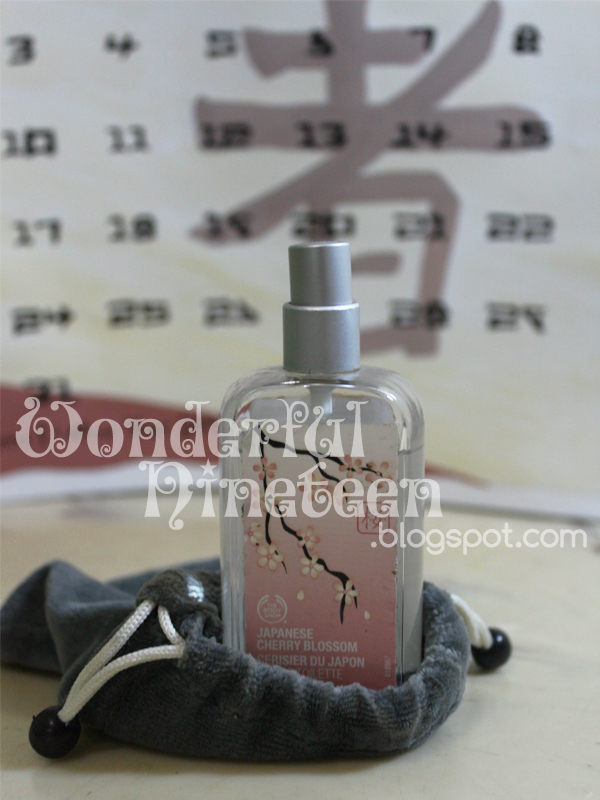 I could feel the'Cherry Blossom' (eventhough I never see or sniff on it) from this product. A really cute packaging from The Body Shop. I do really love the Japanese Cherry Blossom. The price is around Rp. 229.000,- at store. You can check all The Body Shop products with the price in here. Well, I'm a visual communication design (which are widely know as graphic design) student. Live in North Jakarta. Like ALMOST everything about Japan and wish if one day I could move and stay in that country.Interesting in movies, drawing, photography,cooking, and many more..